It's easy enough to pinpoint when and how Indians fell in love with the World Cup. There was no television or even radio commentary from the tournament in Sweden in 1958, but newspaper coverage introduced sports enthusiasts in a newly independent nation to the exploits of a 17-year-old Pele and a Brazilian team whose skill and panache would define a generation. Those were good days for Indian football. After failing to travel to Brazil in 1950 - they were drawn in a group with Sweden, Italy and Paraguay - the national team went to the Melbourne Olympics in 1956 and played the hosts off the park. Neville D'Souza scored a hat-trick and grabbed another against the formidable Yugoslavs to finish joint top-scorer as India finished fourth. Four years after Pele and exposure to Brazil's samba style, India went to the Asian Games in Jakarta and won the gold medal, defeating a South Korea side they had lost to in the opening phase. In PK Banerjee, Chuni Goswami, Peter Thangaraj and Jarnail Singh, India had some of Asia's finest players of that era. It wouldn't have been considered a surprise if it had been them rather than the dynamic North Koreans that journeyed to England in 1966. More than four decades on, no one has made a documentary about Indian football's golden generation, nothing to compare with the wonderful The Game of Their Lives. Nine years after that Asiad gold, India celebrated a first cricket triumph in the Caribbean in 1971. A few months later, the team won in England. With opening batsman Sunil Gavaskar the hero of a new generation and football on the wane, a country's sporting future was written. Football and hockey withered away, and cricket hogged the stage. By the 1980s, the football team had become continental whipping boys. 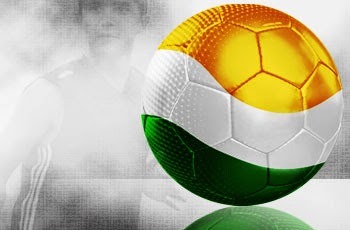 Until Bob Houghton negotiated a path to the Asian Cup through victory in the AFC Challenge Cup of 2008, India hadn't qualified for Asian football's showpiece event since 1984. The levels of interest in the World Cup in South Africa suggest that a corner might soon be turned. India's victory in cricket's Asia Cup was little more than a blip on the sporting radar, with sports pages still dedicated primarily to Rooney's woes and the German New Wave. An estimated 20 million people watched the World Cup opener between South Africa and Mexico, more than had tuned in for the IPL's opening game in March. The total TV audience for the World Cup is likely to cross 100 million, though the ardour has cooled slightly with the exit of the traditional favourites, Brazil and Argentina. More than 50 years on from Pele's precocity, the Seleção are still the team of choice for most Indians. In the football heartlands of Kerala, Bengal and Goa, you couldn't walk more than a few yards without finding a poster or cardboard cut-out of Kaka, or even the absent Ronaldinho and Ronaldo. But a younger generation that I belong to has divided loyalties. While some plumped for Brazil as their fathers and uncles had, there were others so mesmerised by Diego Maradona's exploits in Mexico that they couldn't imagine supporting a team other than the Albiceleste. The Brazil-Argentina divide has almost as much edge in these far-flung corners as it does back in South America. The presence of Maradona on the touchline consolidated the passion for Argentina this June, while Dunga's approach - as well as Brazil played at times against Chile, and in the first half against Netherlands - had many fans muttering about the samba legacy being betrayed. As it turned out, Argentine fans had less than a day to celebrate Brazil's exit. A vibrant Germany didn't just beat them, they left Maradona and his thousands of fans in a state of shock. With as many as five English Premier League games telecast every weekend on local cable, and La Liga coverage available until last year, there were quite a few backers for England and Spain as well. The choices of the new generation were largely dictated by club loyalties. Many Manchester United and Chelsea fans threw their weight behind a feeble England, while Cesc Fabregas' talismanic status at Arsenal ensured a strong following for Spain, even if his role has been a bit-part one. Those who had invested in CR7 jerseys when he was at United had a soft spot for Portugal, while others looked to Didier Drogba, Samuel Eto'o and Sulley Muntari to spearhead the developing world's challenge. Apart from reams of newsprint devoted to South Africa 2010, there have been TV shows by the dozen - some excellent, many indifferent. There are contests, giveaways, online fantasy games and some exceptionally good blogs. And it's no testosterone-only zone either. One of the best blogs out there belongs to Supriya Nair (http://angrynun.blogspot.com/), who works for Verve's Indian edition. There are thousands of other women like her, au fait with offside and 4-2-3-1, whose interest in the game transcends David Villa's hair and Ronaldo's six-pack. Watching football is one thing, playing it quite another. With open space at such a premium in the big cities and even in places like Kerala and Goa, translating the passion into on-field results is India's big challenge. If Sunil Chettri succeeds after his move to the Kansas City Wizards in MLS, it will give young kids a local hero to follow. Gouramangi Singh, a centre back, may not have impressed those that mattered during his recent trial with Melbourne Heart in the A-League, but more and more fledglings are likely to leave the nest and spread their wings. Once India finds its pioneer, its Cha Bum-Kun or Hidetoshi Nakata, the world's second-most populous nation may finally regain the status that it lost in the '60s. For now, millions are absorbed in a European battle for supremacy on the continent it once colonised. The emotions may seem artificial and second-hand to cynics, but once Villa, Torres, Sneijder and Robben take the field, hundreds of thousands put their lives on hold. Thankfully, there are no vuvuzelas. Yet.